As many of you know I recently had the opportunity to again travel to Ireland and study silversmithing, with Brian Clarke. I am neither easily impressed, nor am I an easy student to teach, but I have to say that the workshops are first rate, and that Brian was a pleasure to learn from. I would recommend the experience to anyone with an interest in metal. On my second visit I had the opportunity to to work with Michael Good for a week learning about decked forms and anticlastic raising. After Michael left for Switzerland, Brian, I, and a couple other metalsmiths made ribbon torcs of the kind from 1200 BCE. We worked in large measure with primitive tools, using antlers for stakes and mallets. Pictured below are the projects that I completed on my first visit. The setting, accommodations, and food were again all lovely. The photograph at the top of the page is of the part of the 2 Km. 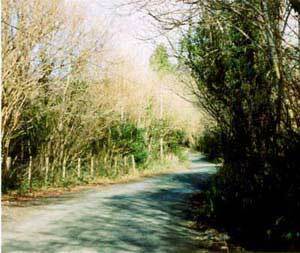 of road between Ballinacalash and Meeting of the Waters, where I would go for walks. 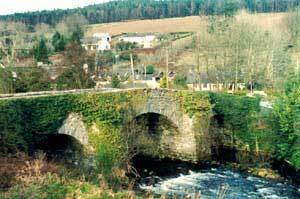 I was rather taken with Co. Wicklow; it reminds me a bit of the parts of Southern Oregon that I come from. On my second visit I had the chance to go on an outing with the local hiking / mountainclimbing club. We went to the summit of Lugnaquillia, the highest mountain in the county. It was not a technical assent, just a couple of hanging valleys, but the scenery was grand. Below you can see two of the old bridges in the county. The first is in Ballinacalash, with the Clarke house and the Old Schoolhouse, where the workshops happen, in the background just behind the bridge. The second is at Meeting of the Waters, with the morning sunlight on it, next to the Thomas Moor Memorial, and the old pub. Again I spent time in Dublin filling sketchbooks at the museums, and talking to the staff. Dublin has a sort of gritty blue collar feeling about it that I like, and it is not so big as to be completely overwhelming in the way that very big cities can be. In the city center, around the Liffy, you can walk through the narrow streets to most of the places you might want to go, and there are busses and trains to get elsewhere. There are many bridges over the river, and several are footbridges. Ha’penny Bridge, from which the left picture was taken is one. Here O’Connel Bridge is lit by the setting sun, and reflected in the river. Pubs in Dublin sell an amazing amount of beer. 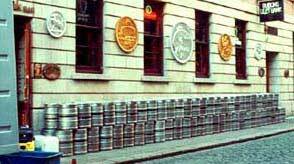 In the mornings the side walks in some districts are filled with empty casks, as in the picture below. This time I did not get to go to Co. Donegal; such a pity. It is starkly beautiful there, with treeless mountains, dark bogs, and stunning beaches. The winds blow right in off the wild ocean. 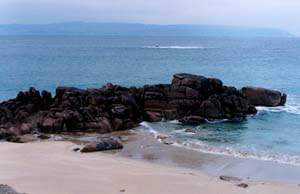 What struck me about the beach there was the color of both the aqua water and the ruddy granite sand. Copyright © 2014 Bill Dawson, All Rights Reserved.